Detach Email Attachments. 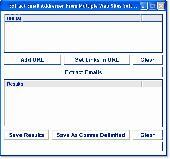 Extract your message attachments from text,eml and msg files. Saves copies of original attached files, in the email files, to your choice of archive locations. cmd line options too! Trial version limited to 25 att. maximum. Retrieve information from stored DBX files. 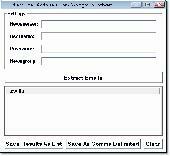 Extract email addresses in one or many MS Access databases. Emails are saved as a text file.